These chocolate cookies are the simplest no bake cookie recipe you will ever find. You wouldn’t think 3 ingredients would be this good but these little chocolate cookies taste amazing! Place the chocolate in the top of a double boiler. Bring the water to a boil. Reduce the heat to low. Cook until the chocolate melts. Add the noodles and peanuts, stirring well. Drop the chocolate mixture by the teaspoonful onto a greased cookie sheet. Refrigerate for 8 hours or overnight. Keep chilled until ready to serve. For the best taste, use salted peanuts as called for in the recipe. You can change them to unsalted but you lose a bit of flavor in the final cookie. You can replace the peanuts with mixed salted nuts if you prefer. These little gems are often called Chocolate Spiders or Chinese Noodle Cookies. My friend Gail was the first one I knew to make these and she makes them every year during the holidays. They make a fantastic Christmas cookie and are perfect for a cookie tray assortment or dessert bar. These no bake cookies are easy to make, everyone loves them and they add something a bit different to the holiday dessert platter. They are really a mix between a cookie and a Christmas candy recipe. The recipe calls for salted peanuts. You can use the unsalted but I would suggest you stick to the salted variety. That touch of salt mixed with the chocolate really does add a nice flavor. Chow mein noodles are available in most grocery stores now. They are those little crispy fried noodles that are about 2″ or 3″ long. You can try it with semisweet or dark chocolate, whichever you prefer. Both will taste delightful. The dark chocolate just won’t be very sweet, since this recipe gets all of its sweetness from the chocolate. If you like this recipe, I’d love you to Pin it to Pinterest, Tweet about it, Like it on Facebook and leave a comment and your own cookie recipes below. 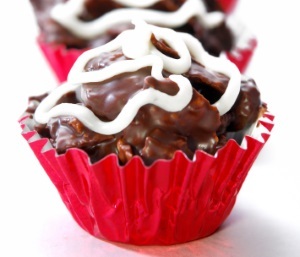 Look here for another delicious no bake cookie recipe – Chocolate Peanut Butter Drops. Browse all of our dessert recipes here.